The rich harvest of tomatoes will help strong and healthy seedlings. To grow such, it is necessary to make her dressing for a special scheme with the use of special fertilizers. In the first few weeks after emergence can be seen as the seedling grows very slowly. In order to enhance its growth and ensure proper development, it is necessary not only to observe a certain temperature, but also regularly produce additional forage. 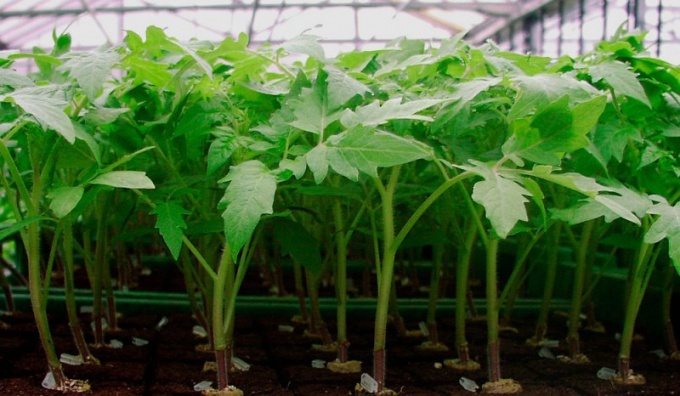 When you notice that the seedlings of tomato appeared the first true leaf, it's time to make the first feeding. For this dilute fertilizer such as "Nitrophoska" or "Agricola" in the ratio of 1 tablespoon to 1 liter of water. Then this solution is distributed to 40 bushes. It will strengthen the roots of young plants, and will accelerate the growth of tomatoes. In a week you must make the following dressing. It is necessary to take the superphosphate. To 1 tablespoon of this fertilizer requires 3 liters of water. The resulting mixture should be distributed to 40 bushes. If the seedlings had too much stretch, then you need, along with a superphosphate fertilizer to use type of Athlete that will impede the development of elite, but will increase the growth of roots. She is bred according to the instructions on the package. 10 days after transplanting seedlings it is necessary to carry out the third feeding. You will need to take 1 tablespoon of NPK and diluted in 10 liters of water. A glass of the finished part need to be split between the two bushes. The next feeding is only possible after 22 weeks. Here already you will need to use superphosphate. He is taken in the amount of 1 tbsp per 10 liters of clean water. The following: 200 ml per 1 Bush. Two weeks is the last feeding of the seedlings. You will need to take 1 tablespoon nitrophoska and diluted in 10 liters of water. One Cup of finished mixture should be poured into every Bush. If the seedling did you notice that it has acquired a yellowish tint, you will need to conduct additional fertilizer, but it must be a leaf. You need to take the Bud for tomatoes, dilute it according to the instructions and exercise for three days spraying of bushes. After completing this procedure, you will need the following day to enter into the soil root fertilizer. To do this, take 1 teaspoon of urea and dissolve it in 1 liter of water. The flow rate is 25 ml per 1 Bush.